I’ve woven paper since I was 9, and I started weaving images in 1991. Although I don’t use computers to make my woven works, they do imply connections to our Information Age. My images recall computer pixelation, but instead of points of colored light, they’re made of small segments of colored plates from art books: tiny fragments of meaningful imagery. And the process of how digital information is encoded in binary code - 1s or 0s - is alluded to by weaving, as in a tapestry, systematically exposing either vertical warp thread, or horizontal weft thread, to produce an overall image. My work is iconoclastic - I destroy images of other artist’s works, I ruin books that document the highest accomplishments of civilizations. I deny a posterity of coffee table adornments, and exceptional tall bookcase shelf spacings, and possible inclusions into rarified libraries of obscure specializations. My work encompasses the ways people regard art: we revere it, we acclaim it, we price it, we insure it, we auction it, we protect it, we forget it, we use it, we destroy it, we bequeath it, we rescue it, we cherish it. My primary medium is woven color plates. Unlike other mediums such as oil paint or clay, “woven color plates” as a medium conveys deep complexity, as if layered like an onion. 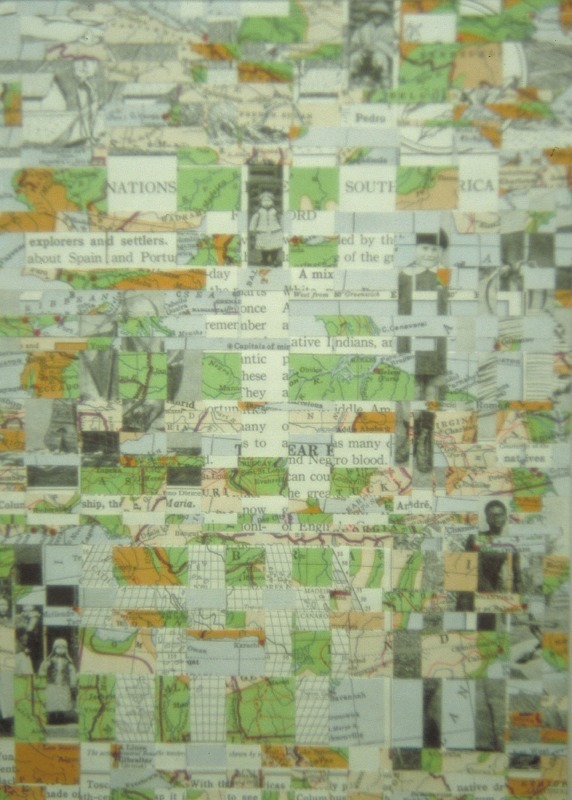 I cut the pictures out of art books, slice them into strips, and then weave them together into different images. That’s the outside of the “onion” of my medium. One layer down, my medium is color and form, each rectangle like a piece of mosaic. Another layer down: my medium is iconography, the meanings within those colors and forms. Peel that away and it’s semiotics, how meanings can be broken down into smaller units, so that like words - they then can be reassembled into new meanings. Another layer cast off - and it’s post-structuralist aesthetics - the information to be inferred by the existence and choice and contradiction of those meanings. Under that layer there’s memetics, the contagiousness of idea viruses that have infected and prodded my brain to assemble particular arrangements of these pieces of paper. And deep down, at the core and root, my medium is human consciousness, outside of time, the response and dissemination of thought from one artist to another, one culture to another. At certain moments when I’m constructing a piece, I feel these glimpses of another person’s thoughts. It’s not the same as reading a sentence in a book by an author, it’s quieter than that, more a sense, or a hunch of something barely conscious - but still “now”. It could be just the choice of a particular blue, or the line describing a finger on a hand, or the mood implied in a tiny rectangle by crossing one strip over and hiding another one. These small fleeting moments of parallel thought are why I enjoy working with this medium so much. It’s why I almost never run one strip from a color plate completely through a piece from side to side, or top to bottom. I need to mix up the conversation, I want these thoughts to bounce off each other in new ways, all the pasts talking about their “nows” to our now, and possibly future nows.